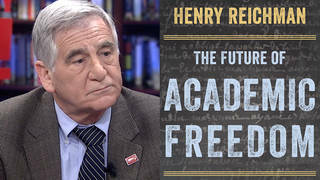 No Child Left Behind: A Debate on the Privatization of Education | Democracy Now! Some of the main sources of criticism from the teachers unions are the administration’s aggressive support of school vouchers, his so-called faith-based initiative and the No Child Left Behind Act, which requires mandatory testing and reporting, with schools that fail to show progress facing cut-offs in public funding. At a meeting with the nation’s governors last month, Bush’s Education Secretary, Rod Paige, created a firestorm of outrage from teachers across the US when he called the National Education Association (NEA) a “terrorist organization” because teachers have been criticizing what they call Bush’s broken promises on his education reforms. When Paige later “apologized,” he accused the teachers of “obstructionist scare tactics.” In response, the Campaign for America’s Future and MoveOn.org have joined together to launch a petition calling on the President to fire Paige. Their website is www.firepaige.org. Some of the main sources of criticism from the teachers unions are the administration’s aggressive support of school vouchers, his so-called faith-based initiative and the No Child Left Behind Act, which requires mandatory testing and reporting, with schools that fail to show progress facing cut-offs in public funding. Bush gained bipartisan support for the reforms in part because the President promised a dramatic increase in funding to provide schools with the help they need to make the law work. Representative George Miller recently charged that the President has broken his promise on funding, falling more than $25 billion short on what he initially promised. Meanwhile, as states face their worst fiscal crisis in fifty years, the President pushed through his top-end tax cuts, while opposing any protection for school budgets. The resulting cuts across the country have made implementing the new law even more difficult. Stan Karp, an editor of the newspaper Rethinking Schools. He has been a school teacher for 28 years. He currently teaches at John F Kennedy High School in New Jersey. Howard Fuller, the chair of the board of the Black Alliance for Educational Options. He is a Distinguished Professor of Education at Marquette University in Milwaukee and the former Superintendent of Milwaukee Public Schools. Bill Graves, Republican state legislator in Oklahoma who has opposed the No Child Left Behind Act. AMY GOODMAN: We’re also joined by Bill Graves, who is a republican legislator from Oklahoma, who is opposed to the No Child Left Behind Act. It passed overwhelmingly, republicans and democrats in the congress. Why are you opposed? BILL GRAVES: Well, for one thing, the constitution makes no — gives congress no power to legislate as to education. That’s not part of the new rated powers of congress under article I. And the founding fathers saw fit to leave that — all that matter to the states. And, you know, I oppose having, you know, people or bureaucrats in Washington dictate how we run our schools and that is what we’re getting the point to and it’s increased education spending tremendously. In 2001, the Department of Education is spending $29 billion, in 2004 it’s $62 billion. And it’s proposed — it’s foreseen it is going to be, by 2005, $64 billion. So, we’re spending a lot of money and we ought to leave all that matter to the states, in my opinion. That’s what — you know, I’ve also heard, even though not only spending the money, a lot of states aren’t getting the money they’re supposed to and that’s why a lot of them are wanting to get out of No Child Left Behind. AMY GOODMAN: Can We have to break for stations to identify themselves and we’ll come back with this discussion. We’ll also be joined by Howard Fuller, who is with the Black Alliance for Education Options in Milwaukee, distinguished professor of education at Marquette University. Stay with us. AMY GOODMAN: I’m Amy Goodman with Juan Gonzalez. Juan? JUAN GONZALEZ: Yes, I’d like to ask a question to Bill Graves, a Republican legislator from Oklahoma as we’re continuing discussion about the No Child Left Behind Act. I understand some of the criticism has been, on the one hand, there are all of these new federal mandates, especially in terms of testing and standards. But at the same time, many of the states are being burdened with having to have these tests, but not necessarily with the resources to be able to then deal with the children who are falling behind or are not meeting standards. And that this is sparking quite a bit of revolt — bipartisan revolt — in a number of states. Your perspective on Oklahoma? BILL GRAVES: Well, if that’s true, in our legislature, we had a resolution asking Congress to make some changes in it because some of the things that you’ve mentioned and also, you know, I think not so much the funding is a problem in Oklahoma as I understand it, but some of the requirements are seen to be as overly stringent, unworkable and unrealistic and that’s particularly true in regards to testing as to English and for disabled students is what — at least that’s according to the report put out by the Center on Education Policy in Washington. AMY GOODMAN: I wanted to bring in Howard Fuller with the Black Alliance for Education Options, professor at Marquette University in Milwaukee, former superintendent of the Milwaukee public schools. You are a supporter of the No Child Left Behind Act as the majority of Republicans and Democrats were in Congress, who passed this. Can you talk about why you like it? HOWARD FULLER: Well, first of all, I didn’t know I was supposed to talk about that. But since I’m on the line, I will. Our organization actually supports the provisions in No Child Left Behind that have to do with parental choice. In particular, we think the right of parents to ask to get out of schools that are not making progress and their ability also to use supplementary educational services as an option. You know, that is what we support. We do think that it is important that we finally have the light kind of shine on schools that are supposed to be great schools, but they’re not serving certain populations very well. So, from our standpoint, while we also have certain concerns about No Child Left Behind, we think the fact that people are now being told what it is that’s happening to black and Latino and poor children in some of these schools is a very important thing. HOWARD FULLER: You don’t know me. STAN KARP: — actually supporting vouchers and the desire to privatize. AMY GOODMAN: Just one at a — one at a time. Just one second. Howard Fuller, your response to that. STAN KARP: What I’m saying is I don’t even know who this guy is. HOWARD FULLER: Yeah well, he’s talking about the fact that I oppose public education because I support options for parents. My view is that public education and the system that delivers public education are two separate things. I support a strong public education system. I also support giving parents options so that they can make choices for their children. Just like rich people do. I found it interesting that he’s pontificating about the fact that so-called privatization occurs because low-income parents are now able to go to tutoring that may be run by private entities. People with money have been able to do that all the time. And I don’t remember him or his publication protesting the fact that rich people have the capacity to seek help for their children. Now he is talking about how terrible it is that poor parents will have that same opportunity to access some of these options for their children. STAN KARP: Let me give you an example of why I think this law does not help the kids in my school or children generally in public education. I teach in an urban high school in Paterson, New Jersey and we have a small school within the school project where students do need extra tutoring. Under the No Child Left Behind provisions for tutoring, a school which does not pass the adequate yearly progress requirements for testing cannot use federal funds under this law to tutor its own students. It must use — it must get some supplemental outside private provider because — as a matter of fact, a private provider which does not even have to meet the same kind of requirements for a highly qualified professional credentials that public teachers have to meet. It’s similar with the Choice Provisions under No Child Left Behind. STAN KARP: If I could finish. HOWARD FULLER: It’s a public school. STAN KARP: And it doesn’t build any new schools in those districts that are struggling and failing. So, it supports choice basically to support a demand for placements that don’t exist and to generate this demand for voucher systems which will hurt public education by taking resources and students out of the schools that need the most. HOWARD FULLER: Well first of all, it is not true that you cannot have the schools where is the kids are not already being well served, that those teachers can, in fact, provide supplementary educational services at night. I don’t know what they do in your district, but in Milwaukee most of the places that are providing supplementary educational services are the schools that the kids are in. And so, as a matter of fact, there are people who are concerned that some of the teachers who don’t serve the kids well during the day now get a chance to not serve them well at night. I happen to think that that’s not true. That there are schools in Milwaukee — Milwaukee public schools that are providing supplementary educational services for the very kids they have during the day. So I don’t know why it operates that way in your district. It doesn’t operate that way in Milwaukee. JUAN GONZALEZ: Well, Mr. Fuller, I’d like to ask you, in terms of this whole issue of the best approach to dealing with children, African American, Latino minority children, poor children in the inner city schools — isn’t most of the recommendations of educators, that the principle determiner of whether you can have success in the public schools or in any school, is class size, the number of children that a teacher has as responsibility for having to teach on a daily basis? And that the biggest problem has been to — the disinvestment at the state level obviously because public education is run at the state level predominately by the states in the urban public schools? HOWARD FULLER: I think what is happening here is you just asked me two separate questions. The fact of the matter is that there is research that shows that small class sizes benefit kids, and in particular they benefit kids in the early elementary school levels. The research is mixed on what is the impact overall. But intuitively, most people — and I would agree you would want children in smaller class sizes. In fact, I really think we should be talking about particularly at the high school level, smaller schools. Not just smaller class sizes. The second thing that I would argue is that if you get smaller class sizes and you have people treating kids and teaching them in the same way, the fact that the classes are smaller in and of themselves, won’t mean that kids are going to benefit. But it is true and it is important that we have smaller class sizes. The issue of disinvestment, as you call it, in public schools, is another issue. It’s an issue related to — and I happen to think that kids in poor areas don’t get the amount of money that they ought to have. But you have certain cities where you have, where you’re paying $10,000, $12,000 per student and we’re still not getting academic achievement. So for me, it is an issue of the right amount of resources. But it is also how those resources get used. And I happen to think that we ought to be able to provide policies that allow dollars to follow students and give parents options to find other schools, both public and private, that will work for their children. STAN KARP: — reconstitution. Or the imposition of private management on public schools which is another sanctioned that this imposes on schools. AMY GOODMAN: One at a time. STAN KARP: If I could just finish. In fact they’re not even educational strategies at all. HOWARD FULLER: It’s not true what you are saying. That’s not true. STAN KARP: They’re political strategies to bring a kind of market reform to public education, and many of us fear that this is going to increase an inequality in education, just like it’s increased an inequality in health care and housing, not reduce it. HOWARD FULLER: You know, you talk about political strategies. You must think that we’re stupid. If you think that we’re going to sit here and allow you to act as if the N.E.A., other unions and people like you don’t have a political strategy is insane. STAN KARP: You mean teachers? HOWARD FULLER: Everybody has political strategies in education. The issue is in whose interest? And I would argue that it is in the interest of low-income parents for them to have choice, for them to have options. For them to have the same choices, the same options that people with money have. And for people like you to continue to argue that for those options to occur, that people are opposed to education is just simply not true and to say that there is no information anywhere that shows that people benefit by choice is also not true. Because if you know — and I assume that you do — you know that there’s studies out there that, in fact, show that there have been improvements and there are studies that debate that, because the one thing that happens in America is anytime you put out any study, whoever opposes it is going to come out with another study that says that it’s not true. So there are studies out there that show improvement, particularly for African American kids and low-income children who are taking advantage of various aspects of choice. JUAN GONZALEZ: Mr. Fuller, what about this whole issue that is a central part of the No Child Left Behind Act, of this increasing emphasis on testing, especially high-stakes testing as a means of determining progress in education? There are some who are criticizing this as basically determining a rote approach to learning, and preparing just to take tests in the schools, and not developing learning and education as a creative experience? What is your perspective on that? HOWARD FULLER: Well, first of all, I have concerns about the testing — my concern actually has to do more with the lack of being able to show value added. What I mean by that is when I was superintendent, I would sit down with teachers, third grade teachers, who would talk to me about the fact that they might get a kid at the beginning of the year who was as non-reader. And they may do a hell of a job and get that kid up to say, a second grade level in a year. But they would still bomb on the third grade reading test because there no way to show the value that they added in that year and I think that that’s wrong, because I think there are teachers out there who are doing extremely good jobs with kids who have a lot of issues. But you are not able to overcome all of that in a year. So one of the concerns that I’ve had and that I’ve expressed to the Secretary and others is about not being able to show value added. The second problem that I have is that with the way that the regiment is set up, it’s kind of a disincentive for people to start schools and take kids who are way behind because you are not going to be able to catch those kids up in a year or two and so you will automatically get on the list. I think that that’s a problem for new schools. I think it is also a problem for schools in the public system who have a lot of kids who are way behind. AMY GOODMAN: I wanted to bring one more person to this conversation, an investigative journalist named Phil Wilayto, looking at the role of foundations in the whole shift towards privatizing education. HOWARD FULLER: Excuse me. I have an 8:00 conference call. So I have to leave. But I appreciate you allowing me to be on. AMY GOODMAN: Thank you very much. Howard Fuller with the Black Alliance for Education Options. PHIL WILAYTO: In regards to the matter of choice, the law of No Child Left Behind provides if a student fails for two consecutive years, they can put the child in another public school or charter school, but not in a private or religious school, and I think that is wrong. That’s taking away choice and, you know, the private schools have done great in teaching kids, especially because they utilize phonics particularly in teaching, reading and that sort of thing. So, this is a setback for real choice in education. AMY GOODMAN: Let me bring Phil Wilayto into this conversation, investigative journalist. Can you talk about the role of private foundations? AMY GOODMAN: We just have a minute. PHIL WILAYTO: —-In which he said that public education is a socialist idea, and he did not mean it as a compliment. Mr. Joyce’s foundation was the one that poured the money into the black alternatives for education -— Black Alliance for Educational Options that Mr. Fuller heads, as well as the Institute for the Transformation of Learning at Marquette University. The interest that the Bradley Foundation has is privatization of the public school system and it’s using organizations like the Black Alliance in order to promote vouchers, particularly in the African-American community when the ultimate goal of it is not only privatization, but the destruction of the public school system. And you don’t have to call that rhetoric. You can just look at the writings that they, themselves, have produced. And Bradley, for those folks who aren’t familiar with it is the organization that funded the Bell Curve, Charles Murray, which argued that African-Americans are intellectually inferior to whites, funded Ward Connerly and his anti-affirmative action referendums, funded the public interest law firms that helped to overthrow affirmative action in Texas and California, funds the whole slew of right wing organizations, the Heritage Foundation, the American Enterprise Institute and so on. PHIL WILAYTO: No friend of the black community and the voucher program, although it raises certain important issues that needs to be discussed, ultimately that works against black people and all working people. AMY GOODMAN: Phil Wilayto, I want to thank you for being with us. Author of “The Feeding Trough, The Bradley Foundation, the Bell Curve and the Real Story Behind Wisconsin’s National Model for Welfare Reform .” Stan Karp, editor of “Rethinking Schools”. Howard Fuller is the head of the Black Alliance for Education Options in Milwaukee. That does it for the show. I’m Amy Goodman with Juan Gonzalez. Thank you for joining us.